When the RMS Titanic sunk in 1912, the grand ship took with her over 1500 people. For over 70 years, the Titanic sat on the bottom of the ocean waiting for man to find her again. Finally, on September 1, 1985, an ocean explorer by the name of Robert Ballard discovered her again. With a three man submarine, Ballard and others went down to the wreck and began taking pictures of her rusting hulk. While Ballard was taking photographs, he discovered that the ship was in two sections that were almost a half mile apart. 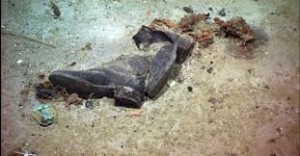 In between the two sections was a debris field, and Ballard and his men took photos of not only items from the ship as she broke apart and sunk, but also pairs of shoes that up until now, were only thought of as shoes and nothing more. There is one picture of a boot and what looks like a coat and other clothing items buried in the mud. The boot has a slightly upward angle, which suggests that perhaps there are bones inside of it. The problem with this picture, and the possibility of their being remains under the mud, is verifying whether or not there is something under there. Is there a way to verify for sure if there is something there? Can a submersible armed with a shovel do a little digging, and the better question is should that area be explored? How would the world feel about finding bones of a Titanic victim that died 102 years ago? A Titanic Controversy – Has Titanic Been a Graveyard All This Time? 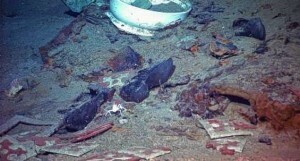 While the discovery of bones buried under the mud at the Titanic resting place would be nothing short of a miracle, the fact is that salvaging from the Titanic has been a controversy since she was discovered in 1985. 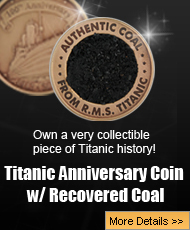 The company RMS Titanic, Incorporated began going down to the wreck to look at it, and also to get items from the debris field, and from the beginning and the appearance of the first artifact from the bottom of the ocean, there has been controversy. 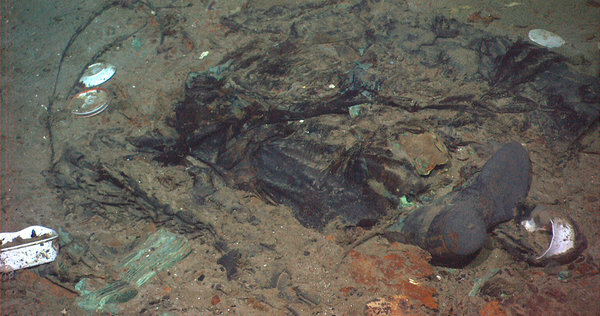 Many people do believe that Titanic is a giant cemetery that should be forever left in peace, but there are others that want to see any artifacts brought up from her. 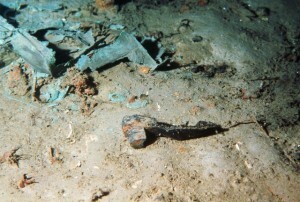 To placate those that protest artifact retrieval, including the late Eva Hart, who was a 7 year old survivor and someone was very opposed to artifact recovery, the one comfort RMS Titanic, Incorporated could offer was the fact that no bodies were found among the debris or anywhere near the wreck. If there truly was a body buried under the mud, then it would mean that the whole time those artifacts were being removed, that the explorers were disturbing human remains. The Shoes in the Debris Field – Just Shoes or Something More? There are many pairs of shoes lying around the Titanic debris field and wreck site. Though there is the one picture that raises the questions of whether there are human remains or not, is this the only location where bones can be found? Some pairs are near debris, but there are others that are in the same interesting positions as the ones in the picture that many believe contain a body that is covered up with mud and possibly clothing. Many people are under the impression that the bottom of the ocean is a calm place, but the truth is that the current down there can be as strong or even stronger than the currents closer to the surface. The current can be so strong along the ocean floor that things can be shifted or moved just like a leaf blowing in the wind. Shoes are partially covered from the sand and mud being shifted thanks to the strong currents, so the possibility of other bodies being buried is pretty high. Should There Be a Search For Bodies? The RMS Titanic has been on the bottom of the North Atlantic for almost 102 years. It is difficult to say how much longer the grand lady will be around because time is not on her side and she is slowly rusting away. A big piece of Titanic has already been brought to the surface in an effort to preserve her, but with her legacy slowly disappearing, should the areas around the shoes be searched for bodies or should the grand old lady truly be left alone? The discovery of bodies buried in the mud would mean that families would get their closure, but would it also open a can of worms? Many people feel that anything historical should be treated with the utmost respect, and that includes shipwrecks like the USS Arizona and the RMS Titanic. 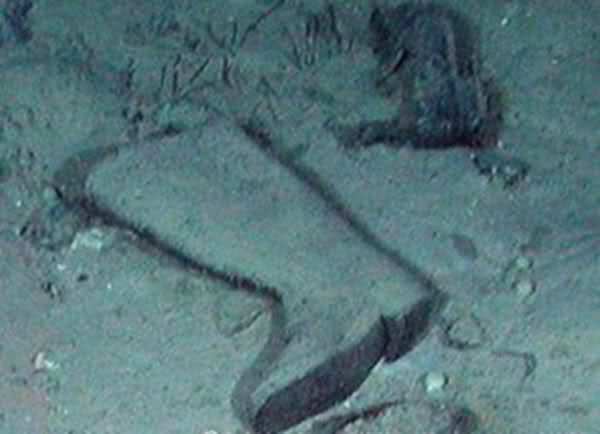 Until someone goes down there and does a powerful enough scan, or even lightly digs in the mud to see what is under those shoes, then the question as to whether or not there are human remains are at the Titanic wreck site is never going to be answered.